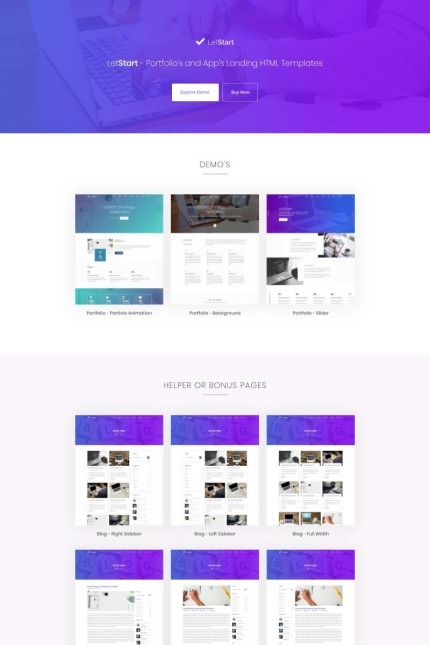 The Letstart template come with 6 Unique layouts of Portfolio landing page layouts. This template is easily customized and fully responsive and support to all modern browser and devices. Letstart is an full featured, multipurpose, premium bootstrap HTML5 template built with Bootstrap 4 Framework, HTML55, CSS3 and JQuery. This HTML5 template will suit Porfolio Landing, Apps Landing, PPC Compaign, Digital Agency, Mobile, Blog, Business One And Multi-Page landing and Technology websites. In Letstart include very smooth animation which makes your website more beautiful. This template modern design, clean codes, elegant curves, practical layouts and easy to customize, easy to change color and many more. LetStart is one of the best HTML5 templates. With this bootstrap HTML5 template, you can quick start your project. Why waste time starting from scratch; try out our single page protfolio or app landing page template. LetStart is crafted based on w3c validation design guildlines so that you can be assured that your application follows the best practices in usability and performance.